New York City-based designer J. S. Nero created the WiVes’ Table, a versatile coffee table that can be set up in a variety of different styles. The designer heat-bent an equilateral steel triangle into a sturdy three-point, origami-like base. The folded metal base can be used as a table on its own or it can be paired with a slab of wood for greater surface area and a different look. Currently, the line is available in raw steel, custom patina, semi-gloss white, and high-gloss yellow powder coats. 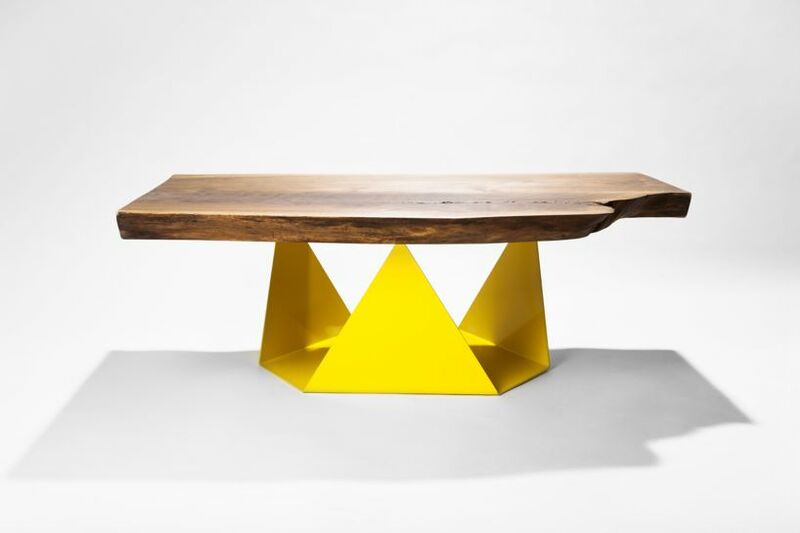 New York City-based designer J. S. Nero created the WiVes' Table, a versatile coffee table that can be set up in a variety of different styles. The designer heat-bent an equilateral steel triangle into a sturdy three-point, origami-like base. The folded metal base can be used as a table on its own or it can be paired with a slab of wood for greater surface area and a different look. Currently, the line is available in raw steel, custom patina, semi-gloss white, and high-gloss yellow powder coats.